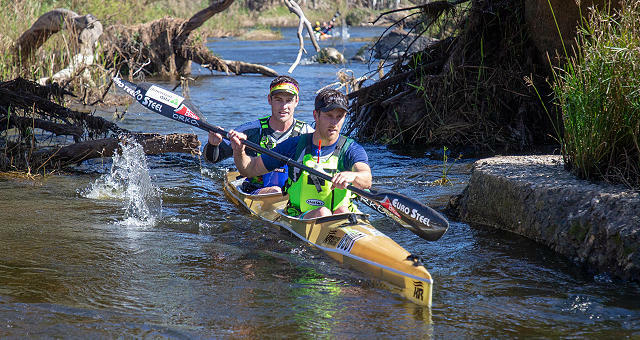 Stu MacLaren and Kenny Rice raced away on a low river to retain their title at the Breede River Canoe Marathon, posting a comfortable win over the crew of Gavin White and Loveday Zondi, with canoeing’s ‘comeback kid’ Shaun Rubenstein stunning the event by racing to third with young star Jordan Zeelie. The EuroSteel/Orka pairing of MacLaren and Rice held a massive five and a half minute lead after the 33km first stage from Bonnievale to Kam’Bati Resort, and extended that by another three minutes on the shortened second stage from Drew Bridge to Kam’Bati. It was a fourth Breede title on the trot for MacLaren. “Mission accomplished,” said MacLaren. “We managed to win the race again and, just as importantly, it was a good hard training session for the marathon world champs in two weeks’ time. “This combination with Kenny (Rice) just seems to get better and better every time we race together. We clicked nicely this weekend, and that gives us great momentum going into the worlds in Portugal. “Day One was a bit of a mess!” he said. “We would manage to get away at the front and them I would paddle us up onto some rocks or a shelf and we would have to get out, which let the two chasing boats catch up again. “Once we were past Drew Bridge the water became easier to paddle and we managed to get away to grind out a five and a half minute lead, which was really useful going into the shortened second stage which also started at Drew Bridge. They made no mistakes on the short second stage, with the Breede River still running low, despite the arrival of the cold front on the weekend. The hallmark Waterfall Rapid was made a compulsory portage due to the low water conditions. Behind them the race for second, and the national silver medals, provided for thrilling entertainment for the spectators. Local marathon stalwart Gavin White had secured Gauteng icon Loveday Zondi for the race, and they were locked in a needle tussle with the crew of young Eastern Cape speedster Jordan Zeelie and Shaun Rubenstein, making his return to competitive after a long lay-off. With Zeelie driving the boat, leaving Rubenstein to concentrate on providing the power from the back seat, second place position changed numerous times. White used his guile to get ahead by taking a sneak channel, but the scrap was only finally settled when Rubenstein and Zeelie holed their boats five kilometres from the second stage finish, leaving White and Zondi clear to canter home to the silver medals. 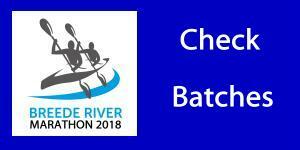 Just as thrilling was the charge by Under 23 athletes Zach Preyser and Dan Jacobs, who stormed from sixth overnight to finish fourth, winning a stacked race for the SA Under 23 K2 river marathon crown. 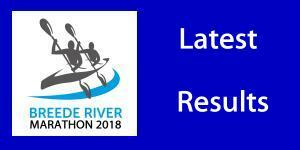 Bartho Visser and Gustav Smook finished just off their rudder and took the Under 18 honours, with Ross Leslie and Sam Butcher netting the Under 16 medals. 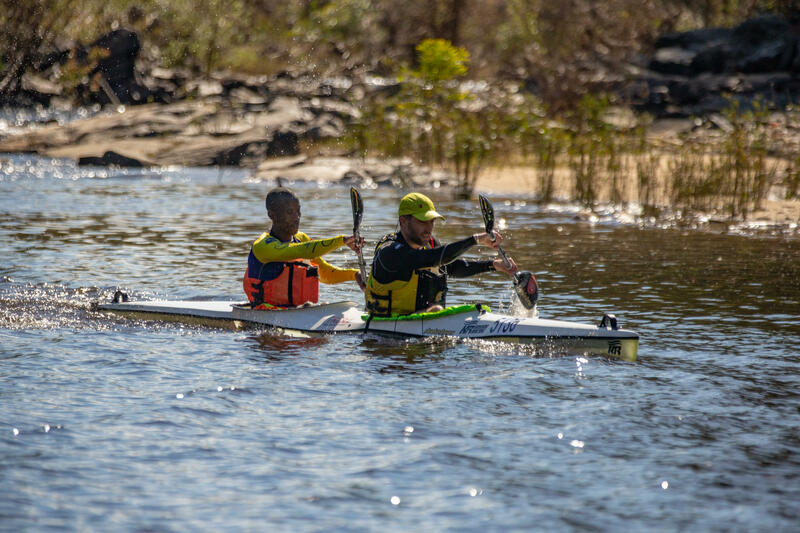 A last minute change from a K1 entry to a Mixed Double entry with Jess Pollock paid dividends as Simon Van Gysen bagged the Canoeing South Africa gold medal in that class after racing to a solid sixth place overall. 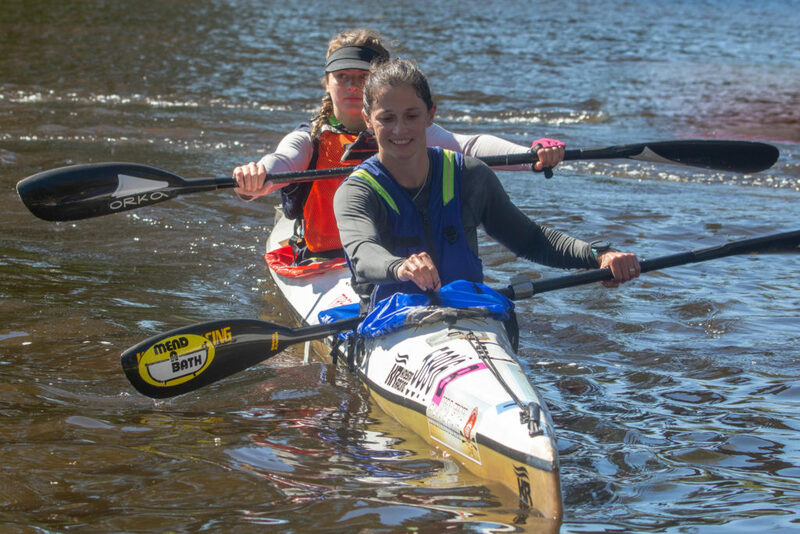 Kim van Gysen added another SA title to the Van Gysen swag when she and Abigail Liesegang crossed the finish line as the first all-female crew home. Dom Notten was the first K1 home in thirteenth overall, just ahead of Phillip Smith.